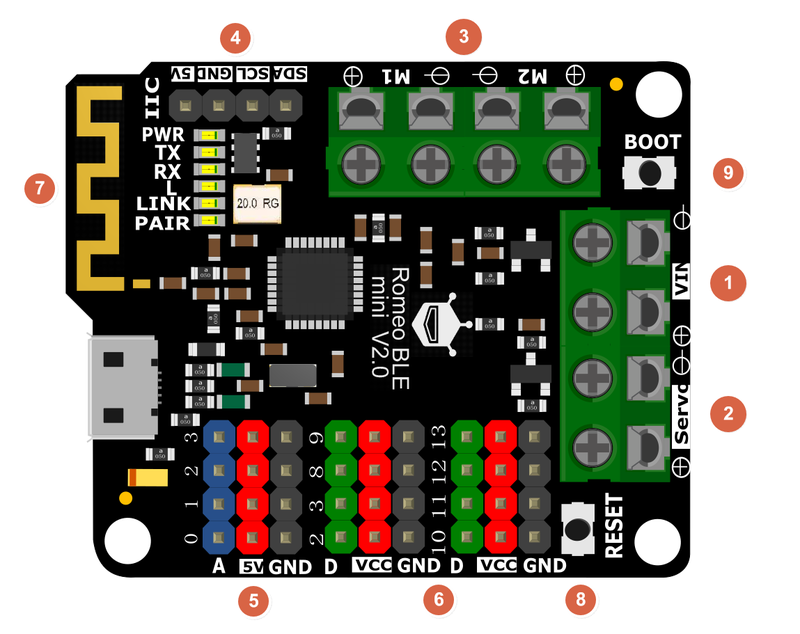 Romeo BLE mini is a simplified version of Romeo board. It inherits all functions of Romeo BLE. Moreover, IT GOT A SMALLER SIZE! Yes, you got it all. It has 8 Digital pins, 4 analog pins and integrates Bluetooth 4.0 wireless communication function. And it can easy to drive the mobile platform using two 1.2A H-bridged Motor Driver to meet the needs of small scale robots. We hope Romeo BLE mini will be a good assistant to Makers. 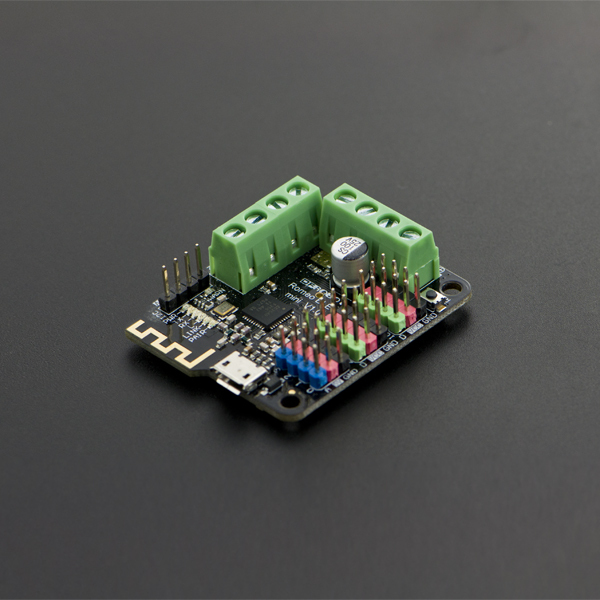 Version Update: V2 has upgraded its motor driver IC, it replaces HR8833 with TB6612 motor driver chip. TB6612 has the same control logic with L298 motor driver. The code will be compatible with Romeo robot control board. And it finally breakouts 2 interrupt pins now! You can connect encoders to make PID motor control. 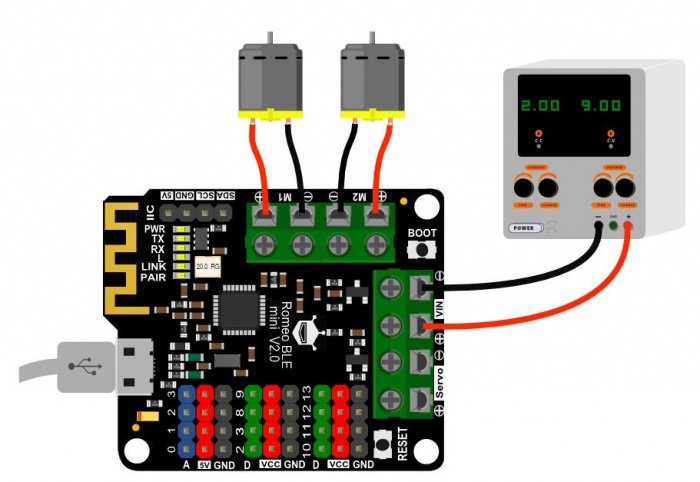 In this tutorial, you can control two motors by enter("a","b","c","d","e") in Serial Monitor on PC. In this section, you can use the Romeo BLE mini to connect with the Android phone or iPhone .The Step by Step tutorial of the Romeo BLE mini is almost the same with the Bluno. In this section, we will learn how to Upload the sketch on air via BLE. It is really amazing that you can do uploading process without a line.The Step by Step tutorial of the Romeo BLE mini is almost the same with the Bluno. How to Wireless Programming through BLE. It is better to update the newest firmware for the better experience. As Romeo BLE mini is using CC2540 chip, the method of the updating is very close to BLUNO. Please choose "Bluno" firmware. Or it won't work. How to update the BLE firmware. Get Romeo BLE mini V2.0 from DFRobot Store or DFRobot Distributor.